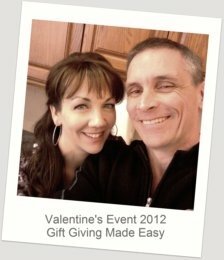 Happy to report that our "Valentine's Gift Giving Made Easy" event went very well! (Thank you Beth, Nick and Claudia for all of your help). It was wonderful to see a number of long-time customers, happy to be reunited with their favourite products, while some fresh new customers were impressed with the quality and selection offered. a very exuberant Mrs. Karen Jackson! (Karen decided to use her gift certificate to treat her man to his own bottle of the Men's Rejuvenating Serum; in her words "hoping he will leave my Rejuvenating Serum to me"). We have decided to plan our "Pure & Simple-Pampering, Launch Party" to coincide with the launch of Purple Essentials' new website. So, something to look forward to - I am excited and will be sure to post the details and date as soon as it is official. As for the new website... steady, exciting progress is being made, but due to Life's Idioms, "Best Laid Plans..." and "When it Rains it Pours" The site's development has had to be put on hold for the last couple of weeks. Looking forward to getting back at it as soon as possible.